Pamela is also a wife, a mother, and a grandmother. Having grown up among people who told stories for entertainment as well as education, she enjoys visiting with readers and others interested in writing. She loves stories, whether in print, on the screen, or just told at family gatherings. Her hobbies include reading, photography, travel, and being a little more interested in technology than the average person her age. As for the incomplete novels still occupying space on her computer’s hard drive, some days the muse sits on her shoulder and she writes. Other days, she finds something else to do. 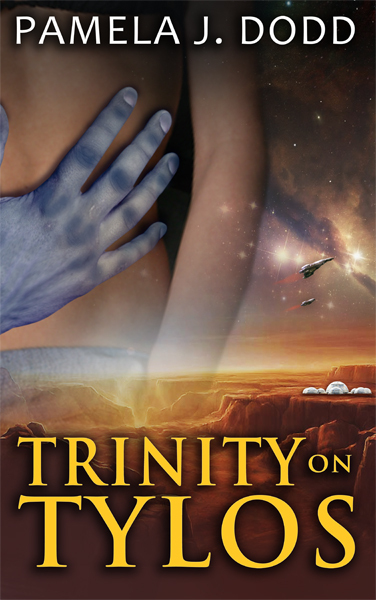 Trinity on Tylos is a “soft” science fiction novel, in that the relationships are far more important than the hardware or the scientific concepts. This story centers on one character, Venice Dylenski, a young security officer on an earth colonizing ship, The Excalibur, journeying though space at some indefinite time in our future. In the course of their travels, the Terrans meet another vessel, and the alien captain, Azareel, initiates a series of get acquainted sessions. Unknown to the humans, however, this alien captain has a problem, one which can only be solved by abducting human females. As their ship faces what seems to be certain destruction, Venice and another female crew member, Alathea Duke, volunteer to go with the aliens because that seems to be the only way to save everyone else. So Venice winds up on a planet in the Tylos star system with one human and one alien companion. And that’s just the first fourth of the book! While this is primarily a science fiction yarn, it does have romantic elements, and there are a number of strong themes, including responsibility vs. self-determination and the importance of motherhood. The female crew members are abducted to serve as surrogate mothers to the aliens, which is a springboard for several aspects of parenting. As the story moves along, Venice struggles to adapt to life among the Archeons, as well as growing into her role as a mother to her alien offspring. Marriage is another theme in this story. The “romantic element” in this novel is unusual, because the main character is married as the story opens, but she is torn away from the husband she loves, early on in the narrative. Losing a spouse is one of the greatest traumas in life, and Venice experiences that. Trinity on Tylos can be read is an action/adventure set in space, but it has themes associated with responsibility and sacrifice. Trinity on Tylos was originally published by Whiskey Creek Press, in both print and eBook form, and it was well received by many reviewers. However, the original publisher did not release it via the Kindle platform, so author Pamela J. Dodd has re-edited this second edition and had a new cover designed, hoping to reach even more readers. Venice Dylenski had measured the possibility of losing hold on that transient state that human beings call life more than once, but at the moment she couldn’t recall a more painful experience. She struggled, her chest heaving, to find a hand or foot hold on a sheer cliff of orange–red rock. One hand grasped a thin, multi–fiber relay cord, while the other searched the smooth rock for a crevice or bump to use as a handhold. Finding none, she quickly returned it to help hold onto the thin cord that cut painfully into the flesh of her hands. Glancing up to the top of the cliff, she caught sight of Corporal Lynn Washington, who was ineffectually bending over an outcropping, watching her superior officer’s struggles. Venice had no time to be annoyed at the young corporal, despite her inaction. “Washington to any unit, Washington to any unit…” As the sound of her voice trailed off, Venice once again turned her attention to her seemingly hopeless position. The pain in her fingers was becoming so excruciating that she feared she would not only be unable to climb, but that she would lose her hold altogether. The geographical sensor banged into the cliff below her as she swung to and fro, still hoping for a foot or handhold. “Good.” Venice prayed for the strength to hold on. “Look for a good anchor. He’ll have to come down for me. My hands are too numb for me to climb up.” Venice glanced upward again, and saw the girl’s blonde head move obediently away from the edge of the cliff. After receiving the slightly garbled message, Lt. Commander Steve Dylenski set off at a run, leaving his men trailing at his heels. The Lt. Commander and Executive Officer of the Excalibur was just over six-foot and slender, but his broad shoulders promised strength. At thirty, he was a man in his prime—still young, yet experienced. Just now his fear made him fleet; he wasn’t sure that his wife could hold on for long, and he was unsure of her position. He ran on, following his com-link’s directional finder, at a pace that Lt. Andrew Redwine and Sergeant Rich Weber had trouble matching. Steve’s direction, Weber wrapped the rope around a large boulder which rested close to the edge. He looked down to check Venice’s position.